Myeloperoxidase (MPO) Activity Assay Kit ab105136 is a rapid, simple, sensitive, and reliable colorimetric assay suitable for use as a high throughput MPO activity assay. In the MPO assay protocol, myeloperoxidase produces HClO from H2O2 and Cl-. The HClO reacts with taurine to generate the taurine chloramine, which subsequently reacts with the DTNB probe to eliminate color (absorbance at 412 nm). 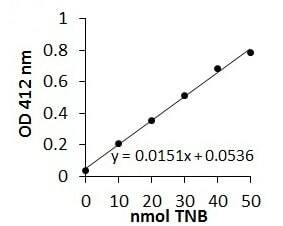 The absorbance is inversely proportional to the amount of MPO enzyme. This MPO assay kit can be used to detect myeloperoxidase as low as 0.05 mU per well. Myeloperoxidase (MPO) is a peroxidase enzyme (EC 1.11.1.7) most abundantly expressed in neutrophil granulocytes. It is a lysosomal protein stored in the azurophilic granules of the neutrophil. Myeloperoxidase contains a heme pigment which causes its green color in secretions rich in neutrophils, such as pus and some forms of mucus. Myeloperoxidase catalyzes the production of hypochlorous acid (HClO) from hydrogen peroxide (H2O2) and chloride anion (Cl-, or the equivalent from a non-chlorine halide). Myeloperoxidase also oxidizes tyrosine to a tyrosyl radical using hydrogen peroxide as an oxidizing agent. MPO activity in indicated cells was measured using the commercially available MPO Activity Assay Kit (n = 3). a. Measurement of MPO activity using WBC lysate (3 μg) and MPO Positive Control (5 and 10 μL). b. MPO specific activity in WBC lysate. Typical standard curve for ab105136. Publishing research using ab105136? Please let us know so that we can cite the reference in this datasheet. We used the protocol in order to perform our assay. For every 10mg of tissue we used 400uL of MPO Assay Buffer in order to extract out samples. We then did a titration plate with samples undiluted, 1:5, 1:50 and 1:100, for different times points 30min, 60min and 120min. 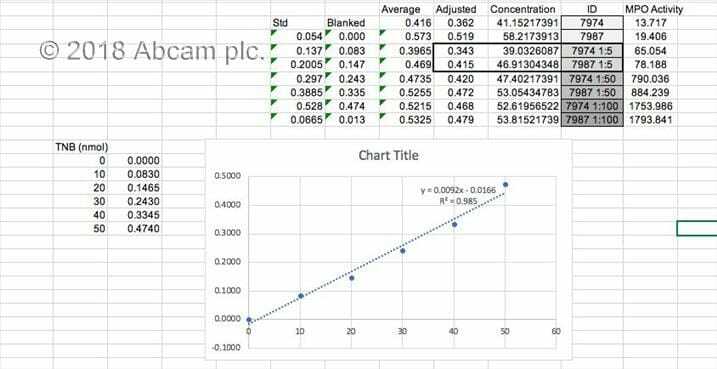 After reading and doing the calculation, most samples were falling right on the border of the highest point on the standard curve. 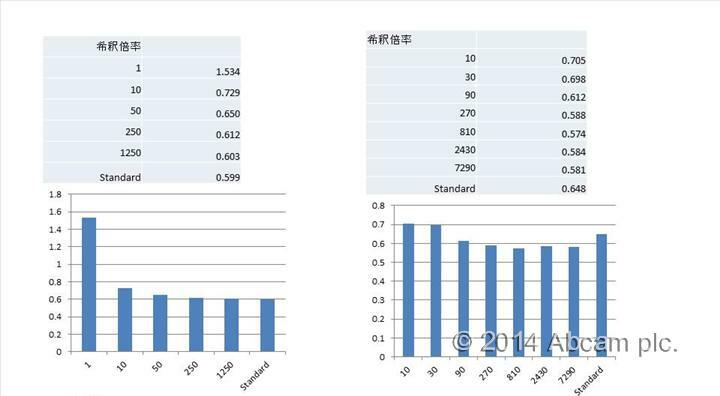 Once we spoke with the Abcam team, they told us that dilutions should not be higher than 1:10. Since we did not test that dilution, our only possible interpretation would be based on the 1:5 dilutions at the different time points. In that case, for our samples, the best protocol was 1:5 dilution for 1 hour incubation. Please see attached picture. I homogenized mouse lever tissues using Bio Masher(nippi) . First time I used Pestle motor for nippi Bio masher (Left image). Second Bio Masher using no Pestle motor (Right image). I can't measure samples OD by automated homoginizer. First time OD can't be measured diluted with MPO Assay Buffer 1:1000. Second time OD can be measured at dilution 1:30 (homoginized by hand manual). There is an example of background and 5 and 10 ul positive control samples on the datasheet. How long were samples run (30', 1 hr, 2 hr?) to produce this data? When we measure the positive controls we do it kinetically over time. Then we select a time between 30 mins to 2 hours and make the graph. It is important to note that the activity of the positive control varies from lot to lot and the essence of this positive control is to help validate that all components of the kit are working well. We do not recommend trying to exactly replicate the absolute values from the positive control data given on the datasheet. I was looking into using the above mentioned kit for MPO measurement. I was wondering do you have any information if this method will work of frozen serum/plasma or is fresh blood always needed. Although it would be preferable to use fresh samples it is probably ok to use frozen serum/plasma with this kit. We ourselves have always used fresh samples with this assay however, we know of scientists who used tissue homogenates stored at -80°C for a short while before use. Since we don’t ourselves have a comparative data measuring MPO in stored vs fresh samples, I cannot comment on if and how much of efficiency of detection is lost in freezing the samples. I'd like to know the components of the MPO assay buffer please? The composition of the MPO assay buffer is proprietary. However we can share that it is a Citrate-based buffer containing 50 mM Taurine and 0.1% NP-40. Probe tube was spun in a balanced microcentrifuge and the bottom broke off. Would like to receive another probe. Thank you very much for you call today and for letting us know about the problem with this tube of probe. As we discussed, please send me the original order or PO number, and I'll see if we can just send you a replacement vial of the probe. So that we can look into the issue with the probe tubes, do you remember the speed and time that the tube was spun for? I look forward to hearing from you. If you have any questions or need anything else, please let me know and I'll be happy to help.